For the second year in a row, Living School, a school with eco-citizenship as one of its core values, was a partner of the Positive Economy Forum. An ENORMOUS THANK-YOU to the children and to all of you, distinguished speakers at this 2nd edition of the Children’s Forum. What an amazing day! You were inspiring and you have instilled in the children the desire to pass to action! In fact, that is precisely what they will be doing this year in their classes with their teachers because, YES, children can change the world! The Deputy Mayor, Mr. Edouard Phillipe, set the tone by promising to take the children seriously over the course of the day and his colleague, Ms. Florence Thibaudeau, in charge of Education, concluded magnificently with the word “Share”. Mr. Serge Tillmann DAASEN, for his part, was able to infuse “Hope” in the children. With Gunter Pauli, the children learned that innovating for the planet – “Yes, it’s possible!” (and even making a t-shirt from algae), an idea that the children set to song (a verse and chorus) the very same day thanks to the talent of Jean Nô. With Pascal Picq, they understood the importance of preserving biodiversity (and that we were not more intelligent than our ancestors). With Patrick and Brigitte Baronnet, they discovered that it was possible to live in a self-sufficient house cut-off from all networks (water, electricity) for the last 40 years. Thanks to Elodie Beaucent, they will put Life on their plates for their health and that of the planet. With Damien Kuhn and Pascale Leportier, they became engaged for reforestation. With Cyril Dion, they experimented with the big picture of how an Open Forum works. With Anne-Sophie de Oliveira, they discovered that they had potential and qualities and that they could celebrate their successes in a Success Notebook. With Pierre-Emmanuel Grange, they hoped that the movement “Rounding-up to Give” would take root in all the stores in France. With Mauve Doyen, they discovered the joys of cooperating to succeed all together. With Tiber Dalton, Juliette Ayach and Caroline Sost, they learned that change starts within each of us (at the level of our self-knowledge) and that stupid children do not exist since all children are naturally intelligent. With Claudine André, they were introduced to bonobos, a species of great ape so similiar to us, and that is in great need of protection. With Catherine Berthillier, they discovered portraits of positive actors for planetary change and communicated with them. With Jean-Baptiste Gastinne, they discovered the Municipal Council Chamber and learned about renewal energy generated by wind turbines. And now, a spot-light on the projects for the year! Some “Projects for the Planet” to make this memorable day the start of a great adventure in service of a better world! 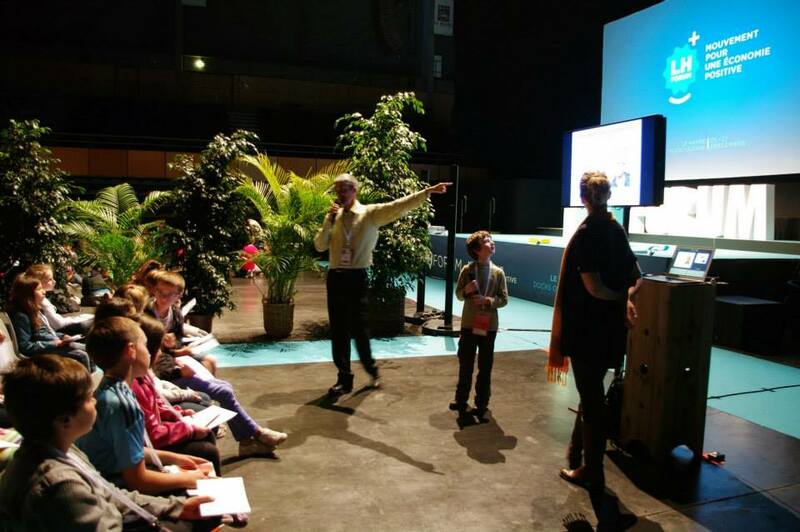 The “Children’s Forum”, an event created for and by children, in partnership with Living School, took place at Le Havre on Thursday, September 25, 2014. 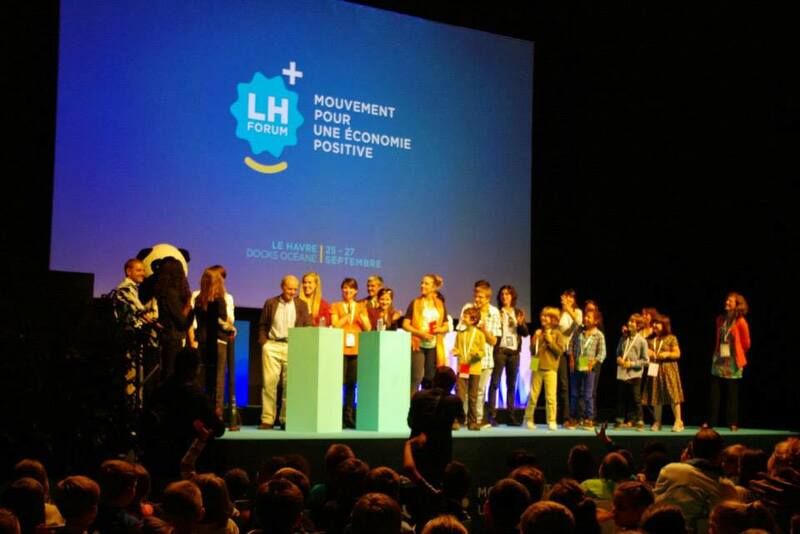 This year, the event took place at the City Hall and brought together 500 CE2, CM1, and CM2 children from Le Havre and the city agglomeration. The objective was: Through workshops at the Children’s Forum delivered by recognized experts, to sensitize children to world issues and to present them with inspiring solutions allowing them to take concrete actions (“Projects for the Planet”) throughout the year in their classrooms. The children who participated in last year’s edition of the LH Children’s Forum presented their “projects for the planet” which they developed over the course of the year. They demonstrated how they have become key change agents who have proven, despite their young age, their desire to transform society into becoming one that is fairer and more positive. 9:40 am – 10:00 am: Conference by Caroline Sost on Self Actualization (“savoir-être”) entitled “Change begins within oneself”. Self confidence, empathy, fairness, affirmation, the ability to manage conflicts are all important life skills and can help to change society for the better. These principles will be illustrated by a role-play performed by two children. 10:00 am -10:20 am : Conference by Pascal Picq entitled “Humanity evolution and the importance of reinvent the city”. Renown and passionate paleoanthropologist Pascal Picq will discuss the importance of preserving diversity and changing our behaviours. Workshop 1: “The Self-Sufficient House: How to Live Without Water or Electricity by using Natural Energy”. Patrick and Brigitte Baronnet, creators of a Self-Sufficient House, will present to the children the story of their life-changing decision and teach children another way to view nature while using the least amount of resources in a spirit of respect for nature. Children will be able to roll-up their sleeves and discover in a hands-on way how to build a wall using clay, and make insect hotels as well as toilets that do not use water. Workshop 2: “Food for the Planet: The Keys to a Healthy and Well-balanced life”. Elodie Beaucent, founder of Food’Joie, will discuss eating habits with children in order to explain, improve and enrich their habits. She will then provide children with the opportunity to handle numerous fruits and vegetables to stimulate all of their senses and help them put together a healthy meal plan. Workshop 3: “Let’s Replant Some Trees: The Importance of Forests and How to Protect Them”. Damien Kuhn, project leader at Kinomé, and Pascale Leportier, Manager of Applied Research at Kinomé, will present to children the vital importance of trees and their protection. A film will be shown in which children give their ideas for protecting the forest. The presenters will discuss a world without trees and will show children how to plant the seeds of pine trees. Workshop 4: “Let’s Round Up: Receiving Inspiration from an Idea of Social Solidarity and Acting to Make it Happen”. Pierre-Emmanuel Grange is the founder of MicroDon and the movement “Let’s Round Up” which allows community organizations to collect spare change. In this workshop, children will learn the concept of rounding up through games. They will then partake in a creativity session for transforming the action of rounding up into a reflex of social solidarity. Contributing presenter: Andrea Hernandez-Diaz, Teacher at Living School. Workshop 5: “Songs of Engagement: Creating and Spreading Messages of Action for Young People”. Jean Nô, also known as Mr. Nô, is a French singer-songwriter and author who is well-known for his project “Les Enfantastiques” that was showcased in the 2013 edition of the LH Children’s Forum. Children will participate in a collective work, as part of “an ideas fair”, which will be followed by the spontaneous and guided creation of several verses composed on a theme chosen by the children relating to the ideas fair. Workshop 6: “Let’s be Humming-Birds: An Open Forum for Local Action”. Cyril Dion is the co-founder of the Humming-Bird Movement for Earth and Humanism. This movement founded by Pierre Rabhi is an opportunity for meeting or exchange for those who want to act for a fairer society. He will recount the legend of the Humming-Bird to the children and will allow them to experience an “Open Forum”, a participative method for finding collective solutions to local questions. Workshop 7: “Developing Self Confidence: How to Believe in Oneself in order to Make Contributions”. Anne-Sophie de Oliveira, Vice Principal of Living School will deliver a workshop on self-actualization designed to develop the confidence of children in themselves. The stakes are high since inner fulfilment is the key to a successful life, learning with ease, and a desire to make contributions. In this workshop, children will take a look at their own richness and that of others through activities designed to highlight their talents and strengths. Workshop 8: “Cooperation: Learning how to Succeed Together”. Mauve Doyen, Manager of Extracurricular Projects and Eco-Citizenship at Living School, will talk to children about the magic of cooperation. They will learn that in cooperative situations, when one succeeds, another can also succeed, whereas in competitive situations, there is only one winner. Through cooperative games, the children will benefit from an atmosphere of mutual help without losers which gives each child his or her place and allows everyone to advance for the collective good. 11:40 am – 12:00 pm: Conference on “Food for Life” by Elodie Beaucent of Food’Joie. Children will discover the basics of a balanced diet that is respectful of living organisms. They will learn about simple and nutritional ways to bring balance to their daily meals. The content of this workshop will be different from the morning workshop and will serve as a lead-in to the picnic. 12:00 pm to 1:30 pm: Lunch break. An organic picnic will be distributed and the children will eat lunch with their teachers at the Saint Roch Square, weather permitting (or, if it rains, in the Francis the First Room). 1:30 pm to 1:50 pm: Conference on “Following the Wisdom of Nature” by Gunter Pauli. Gunter Pauli is a Belgian industry leader who works to develop industrial solutions that are less polluting. He is one of the founders of the Blue Economy which is inspired by nature. He will guide children to think about oceans and water by recounting a fable written for the children of Le Havre. Workshop 1: “Let’s protect the animals: having the heart and the strength to save the bonobos”. Claudine André is the founder of “Lola ya bonobo”, a sanctuary which assists little bonobo orphans in south Kinshasa in the Democratic Republic of Congo. She will tell her story to the children and show them clips from her film “Bonobos”. The children will learn about this incredible species of Great Ape that is so similar to us, why the bonobos are in danger, and how to act to save them. Workshop 2: “The Self-Sufficient House: How to Live Without Water or Electricity by using Natural Energy”. Workshop 4: “Developing Self Confidence: How to Believe in Oneself in order to Make Contributions”. Workshop 5: “Cooperation: Learning how to Succeed Together”. Workshop 6: “Filming for change: Increasing the visibility of change-makers (social entrepreneurs) and their positive projects to inspire change”. Catherine Berthillier, the founder of Shamengo, and former senior reporter for television information shows, will explain to the children why she has made the choice to film those people who are building the world of tomorrow. Portraits of positive actors for change will be shown and children will then discuss the values that touched them. To conclude, using the Shamengo platform, the children will begin a discussion with the creators of that project. Workshop 7: “Songs of Engagement: Creating and Spreading Messages of Action for Young People”. Jean Nô, also known as Mr. Nô, is a French singer-songwriter and author who is well-known for his project “Les Enfantastiques”. Children will participate in a collective work, as part of “an ideas fair”, which will be followed by the spontaneous and guided creation of several verses composed on a theme chosen by the children relating to the ideas fair. Workshop 8: “Wind Turbines: Understanding the Le Havre Project and the Choice to Use an Energy that is Partially Natural”. Jean-Baptiste Gastinne is a municipal councillor dellegate at City Hall who is in charge of economic and tourist development, and veteran affairs. Formerly a teacher, he will explain wind energy to the children and show a short film about current projects in and around Le Havre. The children will have a debate on the topic and will finish by building a small model of a wind turbine. 3:10 pm to 3:25 pm: Closing plenary session with music: A concert will be performed by the musician “Mr. Nô” and children who participated in last year’s edition of the Children’s Forum. 3:25 pm to 3:30 pm: Conclusion by Caroline Sost and Sylvie Chalot, with an emphasis on actions to be taken over the course of the year. After having shared the actions led by the children, the 330 students who particpated could organize an action with their class. A big thank you to the Positive Economy Forum for this wonderful opportunity to highlight children’s activism! To get involved, contact us: info@livingschool.fr.